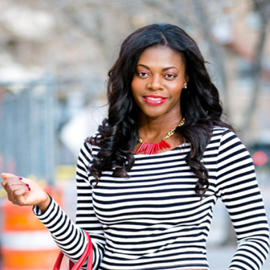 Hello Yvonne: Black, White, Stripes, & Gold! Skirt- Zara (old, Similar), Top- Zara (Similar), Heels- Christian Louboutin (Here), Bag- Tory Burch (Love this). Hope you had a fun or relaxing weekend! I watched the fight with friends like most and I have to say I was entertained, although I expected more from the fighters. It got me thinking about the sport and asked myself if my child wanted to become a boxer, would I encourage it? I think I'd try to steer them into another sport which is less dangerous, less contact, but would support them if they insisted. About the look, I restyled some pieces I already had. One of the reasons I enjoy blogging is, it forces me to learn how to style the same pieces in other ways, although not usually too drastic for me. I just added gold details with a black, white, stripes look. Thanks for stopping by! There's that necklace that I love! Great look, love how you restyled it. I agree too, blogging helps me be more creative with my wardrobe. I have to agree with you about the fights, as entertaining as they can be i have to say I'm not sure I would want my child be boxer either. Looks to painful and I can't imagine the damage it must do to their bodies. Ouch! you look really classy, love the button details on the skirt! Thank you,, and you too! I love the buttons too, thanks lots! Good to hear I'm not alone, thanks lots Jackie!